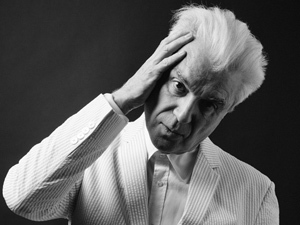 This years Meltdown Festival at The Southbank Centre has been curated by the legendary Oscar, Golden Globe, Obie, Drama Desk award-winning musician and front man from Talking Heads, David Byrne. The annual Meltdown – now in it’s 22nd year – always has an eclectic lineup, this year seems even more so than previous years, testament to Byrne’s diverse appreciation of music and the arts. 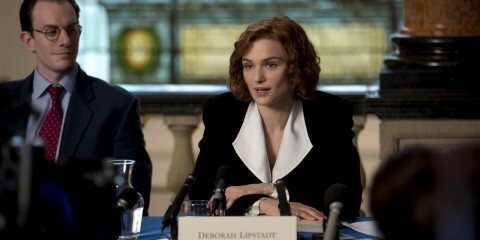 A perfect choice to spearhead the festival. 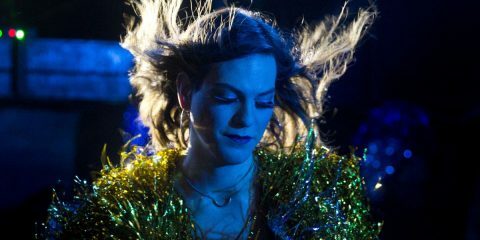 The festival kicked off on 17th August with some Flamenco singing from Estrella Morente, other acts have included Anna Calvi, Young Marble Giants, Matthew Herbert, Benjamin Clementine and drone metal and experimental ambient pioneers Sunn O))). Atomic Bomb! 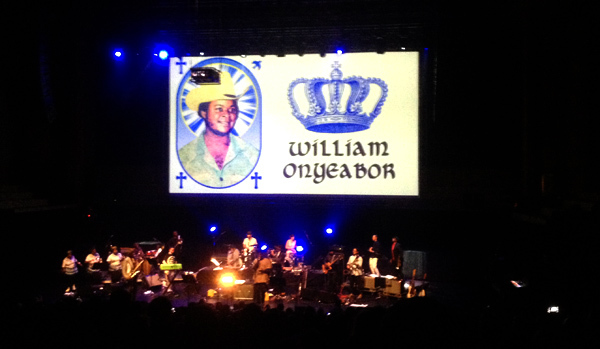 The Music of William Onyeabor, would be the only show of Meltdown i would get the chance to see this year but what a show it was. “William Onyeabor is the greatest electronic musician you never heard of.” says the Southbank website. 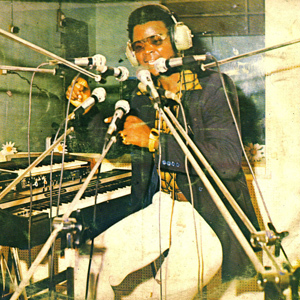 Onyeabor created his own genre of African electronic funk in the late 1970s and early 1980s. However for many who do know him already, he has a magical cult status respected around the World, with followers including; Damon Albarn, Hot Chip, Carl Craig, Caribou, 2manydjs and Madlib. There has been a five year quest to get his music re-issued, there’s a very interesting Guardian article about it here. Atomic Bomb! Is a celebration of the great mans work, performed by an ever changing and evolving line-up of musicians brought together by the world music record label, Luaka Bop, originally in 2014 and now continuing to tour the world. 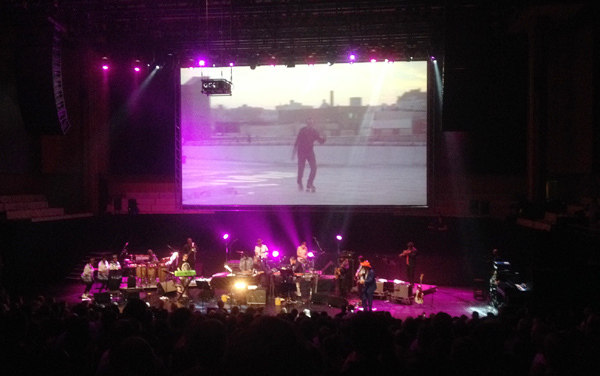 The core of the band comprises Sinkane aka Ahmed Gallab (keys/vocals/music director), Money Mark (Beastie Boys) on keyboards, Jaytram & Sarah Jones (Hot Chip) on drums, fronted with guitar and vocals from David Byrne and Alexis Taylor (Hot Chip), Mahotella Queens (Hilda Tloubatla, Nobesutu Mbadu, Amanda Nkosi) supplying backing vocals and a whole host of superb musicians including; Lakan Babalola (percussion), Ayanwale Ogungbe (talking drum), Ish Montgomery (bass), Jonny Lam (guitar), Charles Lloyd & Jas Walton (sax), Byron Wallen (trumpet) and Moses Sumney & Amadou Bagayoko (vocals). The show opened with the lone figure of Charles Lloyd on Sax performing Poor Boy, which echoed the famous Talking Heads Stop Making Sense concert that begins with David Byrne onstage with just a boombox and an acoustic guitar. It wasn’t long before the entire crowd were on their feet, there were murmurs during the second track but by the third track, Why Go To War every single person in The Royal Festival Hall was on their feet dancing, and that’s how it would remain for the rest of the show. Something which it took the crowd at Goldie’s Heritage Orhestra show a couple of weeks ago, two thirds of the show to achieve. The fourth track was one of Onyeabor’s most famous – Good Name and a glorious rendition it was. The party as it had become was in full swing, more and more musicians joining the stage and visuals now accompanying on the huge screen. The backing singers, the South African, Mahotella Queens joined the stage in time for Atomic Bomb and instantly brought an extra something, even pulling high kicks along with their amazing harmonised vocals. David Byrne himself joined the show about half way through sporting a orange cowboy hat and sharp navy blue suit. Sinkane took over MC duty during Love is Blind and chanted ‘everybody get low… get down to the floor’ of which everyone obliged with glee. 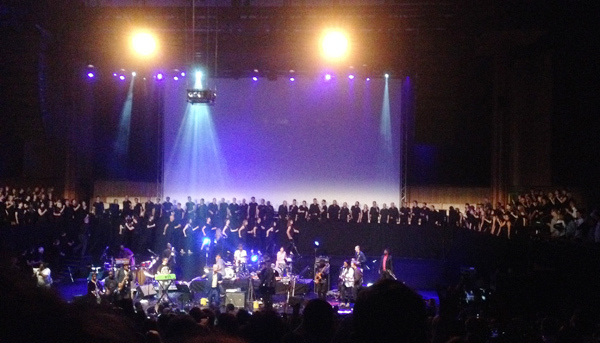 Then came a very brief break before they came back out for the encore, with a 150 piece choir filtering around the back of the stage. The final three tracks, Better Change Your Mind, Let’s Fall in Love and Smooth and Good absolutely blew the roof off. One of the band members was wearing a t-shirt which summed up the night perfectly – NO CASH VALUE. Listening to peoples comments at the end, one woman said “This is the happiest gig i’ve ever been to” and she had a good point. The 90 minute show absolutely flew by. Every single band member received huge applause at the end and had in fact, pretty much had a standing ovation from the third track onwards. A sublime and incredible performance all round, you would be hard pushed to find anyone with a bad word to say about the entire evening. 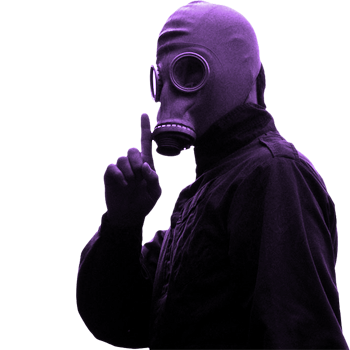 Meltdown runs from Monday 17 August 2015 – Sunday 30 August 2015 so there is still a couple of days to find some undiscovered gems! Don’t be put off if you’ve never heard of the artists before, trust in David Byrne to pick out artists worth checking out. Win Stop Making Sense on Blu-ray!